On Monday, March 2nd, 2015, Mr. UEDA Yoshihisa, Ambassador Extraordinary and Plenipotentiary of Japan to the Republic of Paraguay visited YNU. 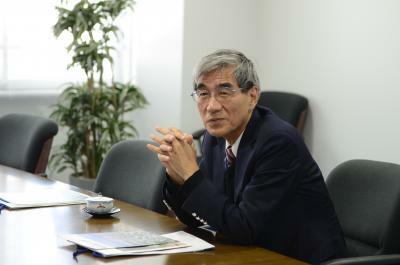 Ambassador Ueda was in service for the ex-Ministry of Finance and consecutively Executive Director of JICA, Head of Office in Asia of Inter-American Development Bank, Executive Director of Latin American Association, and so on. He has been appointed to Ambassador Extraordinary and Plenipotentiary of Japan to the Republic of Paraguay since January, 2014. After the arrival at his post, he repaired a part of his official residence to a tea-ceremony room, modified the embassy’s website and added new contents, and etc. as expression of his efforts to dispatch the circumstances of Japan and Japanese culture, in parallel with his busy official work. 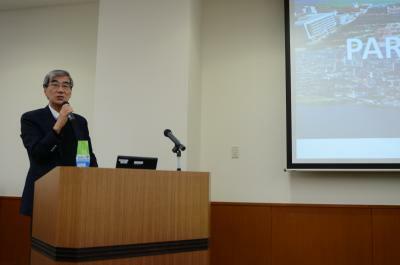 YNU could have the honor of having a special lecture by him, taking the opportunity of his temporary return to Japan. President SUZUKI Kunio welcomed him at the President’s Office and Executive Director and Vice President YAMADA Hitoshi, Executive Director and Secretary-General SHIMIZU Akira, Dean of Faculty of Urban Innovation NAKAMURA Fumihiko, Faculty of Urban Innovation Professor FUJIKAKE Yoko, and International Office Manager Ms. ITO Yoko attended the meeting. In the discussion, a lot of visitors from Paraguay when YNU held an international symposium to focus on Latin America in the past January and other things were reviewed. 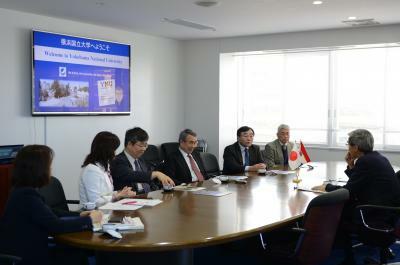 The relationship between Paraguay and YNU was also introduced to Ambassador. After his visit, he gave a special lecture “Paraguay” at the Conference Room No.1, Administration Bureau, for the dedicated audience mainly occupied by faculty members to listen attentively to his lecture.